At TLC, we know that your dogs are more than just pets; they are family members. And because you want to care for them like one of the family, you do what you can to make sure that they look and feel their best. Nail clipping for dogs is more than just a manicure for them. Learn why dogs need to have their nails clipped and common mistakes to avoid at home. Also, you can trust most professional groomers to offer nail clipping for dogs as part of their services. Did you know that nails that go unclipped can cause your dog pain? Many veterinarians warn that unclipped nails can turn their paws into a splayed foot which reduces traction. Unclipped nails for extended periods of time can also lead to deformed feet or injure the tendons causing pain. If this is your first time clipping your dogs nails, purchasing clippers meant for dogs only is your fist step. Never use clippers meant for people. When searching for a pair of clippers, find a pair that is comfortable and easy to control. 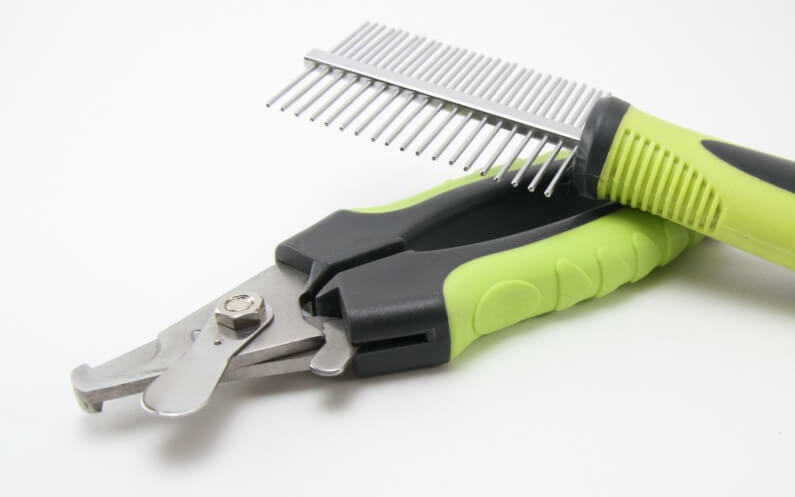 There are clippers available that are motorized, which can sometimes decrease the amount of time spent on each nail and make the process a bit smoother for your furry friend. Grinding your dogs nails also mitigates the chance that you’ll cut them to the quick (which causes bleeding). Take a look here at the 2018 list of best nail grinders for dogs. Don’t rush through the process of clipping your dog’s nails. If you do, then there is a chance that you could tear the nails or clip them too short. This is one of the important nail clipping tips for dogs because cutting the nails too short can sometimes cause excessive bleeding. Make your dog feel like he is special for getting his nails clipped instead of making it seem like a chore or a common task. Prop your dog’s paws on your leg to allow for as much comfort as possible. An idea to consider is to let someone hold a spoon of peanut butter for your dog to lick on while you’re clipping his nails. Massage your dog’s legs to relieve some of the stress in the muscles, making it easier to approach the paws while clipping the nails. Before using clippers, you can place an item that has a similar feeling on your dog’s paws. This simple action can get your dog accustomed to something being close to the nails and the feet. Try to let your dog get used to the sound associated with the clippers by squeezing them nearby, getting closer to your furry friend until you’re able to gently clip each nail. If you have questions about nail clipping for dogs or general questions about pet care, you can contact Kara Jenkins, Owner of TLC Pet Sitter. We are also available by email at info@tlcpetsitter.com.